Home » Blog » Who’s Your Cheerleader?? I am sitting in my office, staring out the window and watching the sun bounce off the snow in my front yard. It’s mesmerizing and I find myself staring at the bright sparkly whites instead of typing words on my keyboard. Distracted and uninspired, not a good place to be this morning. I tend to run in major peaks and valleys when it comes to my writing and creative ventures, and this day in particular is a deep muddy wet valley. I wish I had a cheerleader! Better yet, two cheerleaders. 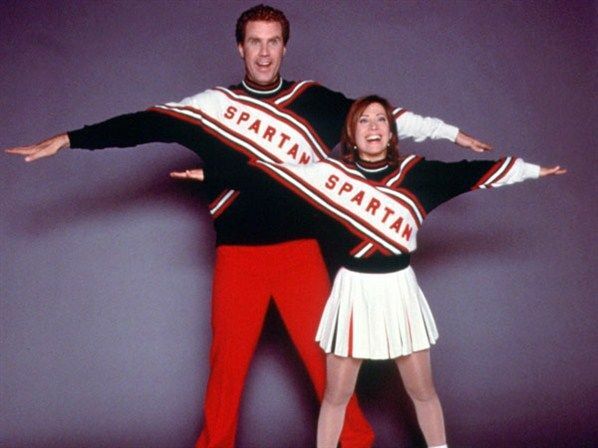 I want Will Ferrell and Sherri Otteri straight from the stage of Saturday Night Live, to jump through the door of my office and do the “perfect cheer”. I need some of their passion and enthusiasm to rub off on my brain and get me jazzed about writing. Obnoxious, unbridled, pep for my creativity–that’s what I need. Reality check! I’m still alone at my desk and I need to write, I have to be my own cheerleader! No one is coming and I’m going to have to “ra ra, sis, boom bah” my own brain. I have to do it myself. First strategy – I start making lists. I don’t trap myself into “to do” lists, they fence me in creatively. I try to focus on lists for business ideas that sound so crazy that they just might work, places I want to travel, my favorite authors, bucket lists, favorite restaurants etc. The lists go on. I write them in a notebook with a purple ballpoint pen. The physical act of writing brings out a different part of my brain than typing, and purple ink has always been “my thing”. I’m not sure where I got this simple little bit of advice, but it has been my short cut for many years. It’s also fun to look back at old lists and to see how many I have brought to fruition. It’s pretty magical when you see how powerful just sending out your intentions can be. Second unblocking strategy – Pick up a book, any book and let it open naturally to the page that is asking to be read. I let my eyes go the first line that catches my eye, which can be at the top of or the middle, it doesn’t really matter. I let those words become a writing prompt. Example- first line I see- “William I must be loosing my mind.” I can use this as a jumping off point and it is a great first line for a story waiting to be born. Here is my stream of writing from the prompt: “William I must be losing my mind. I have lost the keys to the car, my reading glasses and my drivers license all in one day. What is happening to me? I am far too young to be showing signs of dimentia! I seem to be having a really strange day, and there is really no good explanation for it other than i am quite possibly loosing my mind. William are you even listening to me? Oh my God, you’re not William. Who are you? Where am I? This isn’t my house, and these aren’t my shoes.” Panic takes over and I feel my heart racing faster, I can’t catch my breath. —Oh, this is going to be a good story!! This shows how easily you can take one line and let it be your perfect cheer. I can now use this as the beginning of a story, a character in something I already have in progress, or just an open door to get more juicy inspiration flowing. Aren’t you so curious now? I want to write more about this person who is freaking out. I haven’t decided if it is a man or a woman, but I think its a woman. Is this a dream or reality? I can go either way. Who is William? Friend, son, husband, lover, employee? The options are endless. Third option to remove creative blocks – Get up and move! Dance, go for a walk or do some yoga. Physical movement of some kind is necessary when I am blocked. It engages and different part of my brain and helps to keep me from going down the dark tempting hole of internet “research” or Facebook scrolling which wastes hours of my time. I use loud music and dancing, the louder the better. Billy Idol’s “Dancing With Myself” or Prince’s “Baby I’m a Star” will cure anything. Trust me, I’m a girl of the 80’s and these two songs are serious “medicine” for the soul. Magically, this advice works! I just “cha cha chaboochied” myself right out of my rut. I finished this blog post and now I am off to figure out who William is??? I’m so curious?!?! Aren’t you?? Is Meditation Making Your Anxiety Worse??? Am I Going Crazy Or Is There a Dead Guy Talking In My Ear?? ?